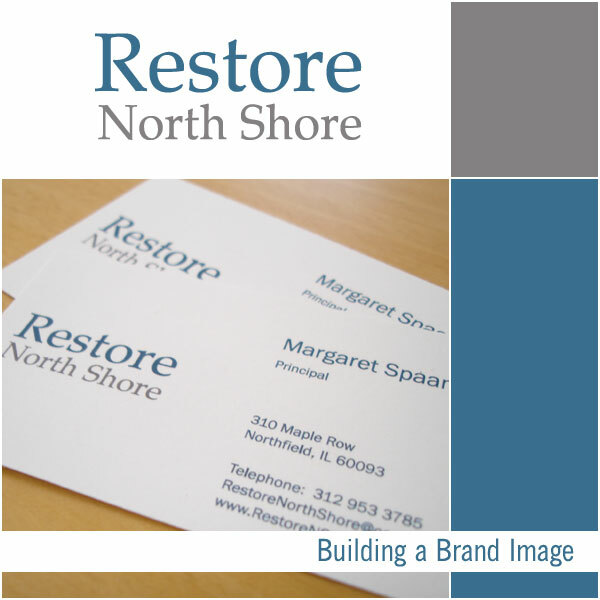 Full image branding is one of my favorite type of projects and I am delighted to be creating brand and marketing materials for a Chicago home remodeling company, Restore North Shore. The project is moving at quite a pace and there is nothing like a deadline to get things moving along. It is energizing. The project started on Monday this week and by Tuesday at noon the client needed business cards to hand out at an open house. In that short space of time I designed the logo, established the color palette, selected a corporate typeface, designed a business card and got full client approval along the way via our online project progress system. Phew! There was no time to get the business cards professionally printed so I took a pdf of the file to a Fedex Office (the one here in Lincolnshire IL is great) where they printed it on card stock using a laser printer and I cut the cards down in their store. While they are only temporary the quality was pretty good and plenty got passed out at a very successful open house in Wilmette. I will be starting work on the web site tomorrow. It will feature lots of before and after photos showcasing the fabulous work of Restore North Shore. Prepare to be blown away.